Being an international student in Malaysia, remember a few vital things. It is alright to be nervous when you’re abroad for higher studies. People get the jitters even while applying to universities in their homeland. Mingling with new people, trying different things, and forming a new pack—everything initially blends into a spine-tingling, throat-parching moment of apprehension. But after meeting the other freshman students, you’ll be able to cast aside the stress and explore the enjoyable side of being one of the international students in Malaysia. This article throws light on the simple ways to make your academic life abroad pleasant and fruitful. Prepare to meet a lot of people. 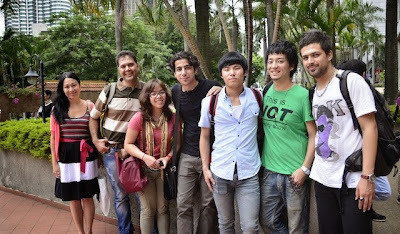 Tons of international students flock to Malaysia each year, providing you a multi-ethnic atmosphere to live in. In 2010, a survey conducted on 199 institutes in Malaysia revealed that 86,923 students in those institutes hailed from Iran, Indonesia, China, Nigeria, Yemen and other countries. This will allow you to thrive and expand your outlook. Make friends that are worth sticking to till the final year. Alumni network in a cosmopolitan setting as such has a lot of benefits. 2. Communicate as much as you can. Being an International student, you are bound to stir people’s curiosity and tackle questions about your background, schooling etc. Smile to people, be polite, exchange Facebook IDs and have an “ais kacang” when you’re having a discussion. The syrup-topped ice will act as a coolant any time the fellow-freshman dealings bog you down. And remember, it is OK to share your canteen table with strangers as long as they seem polite and safe. 3. Steer clear of substance abuse. Malaysia has strict rules against illicit drug use and it may even attract death penalty. So, avoid it at any cost. Remember, your fellow students are also on the same footing here. Don’t hesitate to say hello and get assistance as long as you need to get used to the local markets and food habits. You may feel a little alienated being around locals ceaselessly speaking “Bahasa Malaysia”. But, do your bit to fit in. Show interest in what they’re talking about. English is known to all and they will smoothly interact with you. Sharply contrasting many other more anglicised neighbouring countries, most locals here openly exhibit emotions. Expect simple, clear-cut answers when you’re talking to your new friends around the academic neighbourhood. The country has a plethora of stunning tourist spots. So, when your head is heavy with assignments and you need to soothe your nerves, go out. Try the moist rainforests, long beaches, caves, mountains and waterfalls which are not more than a few hours away from the major universities. The diverse geography draws travellers from all over the world and you will enjoy special holiday-break privileges just a stone’s throw away. When you are tired of dealing with too many project papers, permit yourself for a cool escape to Langkawi’s white sands. You can also sail across the tropical islands in Kota Kinabalu for an unforgettable vacation. Living cost is relatively inexpensive compared to countries like USA, Australia and UK. But big cities also offer sky-high luxury and expensive hotels which you should reasonably brush aside considering your college tuition fees and off-campus living costs. The transport fare, local restaurants, mini markets to malls, Malaysia offers great options for international students. With a $40 dollars-a-month gym subscription and $50 USD transport passes, an international student in Malaysia can enjoy quality living without burning a hole in the pocket. In a regular, low-cost restaurant, $3 USD can bring you 2 square meals. Surfing net would not require more than $20USD a month. Start to invest. This is mandatory for all university students to allocate at least $15 USD per month as health insurance which includes hospitalisation and medical treatment when necessary. In a nutshell, the money required for basic things as food, clothes and lodgings ranges between $3000 to $4000 dollars. This applies to both on-campus and off-campus living costs which ensures better savings for future. 7. Keep your humour alive and kicking! Laughter doesn’t need a language. It is the best remedy for any moment of awkwardness. This will also provide a comic relief to your struggle and occasional sense of isolation. Even if a taxi-driver refuses to turn on the meter, don’t argue. Shrug it off with humour and check another one. If wearing shorts be a magnet for a lot of shooting stares, respect local sensibilities and be careful next time. Just a drizzle of light-hearted humour can ward off many stern looks. Malaysia offers a wide gamut of multi-national delicacies as Malay, Chinese and Indian dishes. An international student in Malaysia shouldn’t miss out on Bakuteh( Simmered Pork-ribs), Hokkien mee( Chinese yellow noodles) and Fresh River Prawns. Even street-side eateries offer light, healthy and delicious options to pick from. If you’re an avid western foodie, McDonalds, KFC, Subway and Burger King can satiate your appetite in major cities. Diverse cultures, luscious landscapes, affordable tuition fees, and lavish food options, an international student in Malaysia truly has reasons to rejoice and say “Terima kasih”!